On March 1, 2017, King Salman of Saudi Arabia and his great entourage arrived in Bogor, Indonesia for his six to nine-day visit to the nation in an effort to deepen ties. Despite this being the Saudi monarch’s first visit to Indonesia since 1970, the relationship between both nations has historically been close. According to Indonesian President Joko “Jokowi” Widodo, Indonesia was home to the largest Muslim population in the world and that, in 1947, Saudi was among the first countries that acknowledged Indonesia’s independence. 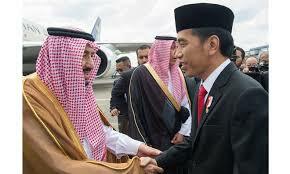 In addition, Saudi Arabia has invested billions of dollars exporting Salafism, a branch of Sunni Islam that advocates a return to the Islamic traditions of the Prophet Muhammad and his contemporaries, to Indonesia. Since 1980, the campaign has built more than 150 mosques (although the country already has about 800,000), a huge free university in Jakarta and several other Arabic language institutes. It has supplied more than 100 boarding schools with books and teachers (although the country is estimated to already have between 13,000 and 30,000 boarding schools), introduced preachers and has disbursed thousands of scholarships for graduate studies in Saudi Arabia. According to the Washington Post, Indonesia’s acceptance of these initiatives is only the result of its need to maintain an annual quota of citizens who can enter Saudi Arabia to participate in Hajj to Islam’s holiest city. Jakarta Post reported President Widodo and King Salman witnessed the signing of 11 agreements, one of which was signed by the Saudi Fund Contribution and the Finance Ministry promising to spend $1 billion to finance various development projects in Indonesia. The $1 billion was much lower than the expected $25 billion in investments. The remaining 10 agreements were aimed at improving the relations between the two countries in areas such as Islamic affairs, information and education, health, maritime affairs and the fishery, international affairs, aeronautics, science, small and medium enterprises and transnational crimes.